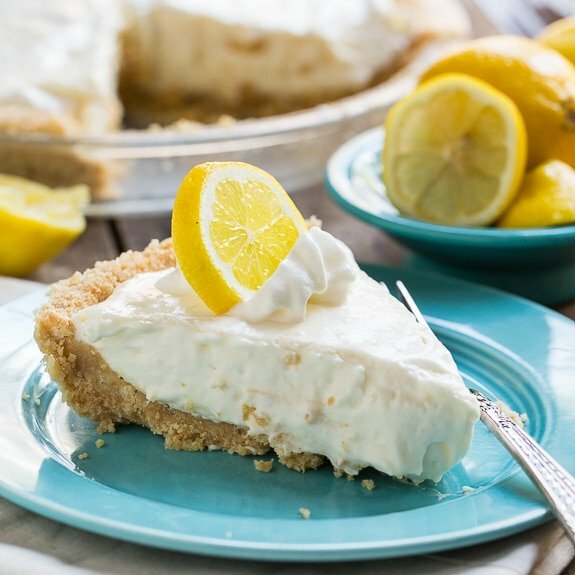 With a buttery shortbread crust and a soft and creamy filling with a bright, tangy lemon flavor, this Lemon Icebox Pie makes a delicious and refreshing dessert for summer. Best of all, there’s no need to turn the oven on. 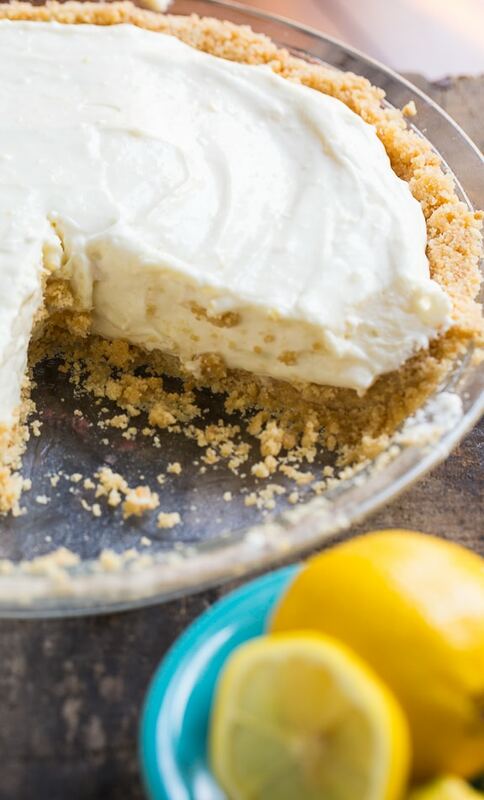 Lemon Icebox Pie is completely no bake. The crust is made from crushed shortbread cookies and melted butter, plus a little sugar to give it enough sweetness to counter the tartness of the lemon juice in the filling. A quick 15 minutes in the freezer and the crust will hold together perfectly. If you don’t want to go to the trouble of making a crust, you could always use a store- bought graham cracker crust. But I really like the flavor and butteriness of a shortbread crust. The filling only takes minutes to mix up so this is still a quick and easy dessert even if you make the piecrust. Some fresh raspberries or blueberries scattered on top would be wonderful. 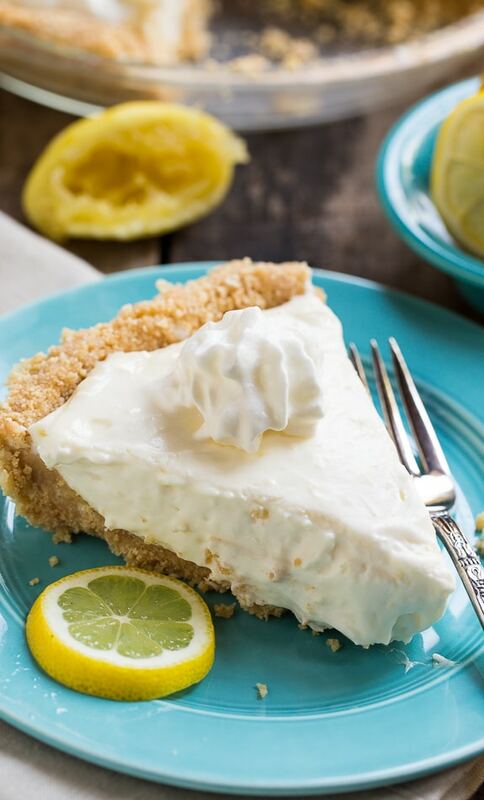 With a sweet shortbread crust and a smooth and creamy lemon filling, Lemon Icebox Pie is an irresistible southern pie. For more mouthwatering recipes follow Spicy Southern Kitchen on Pinterest and Instagram. Use a food processor to pulse cookies into fine crumbs. Place in a medium bowl. Stir in melted butter, 1 tablespoon sugar, and salt. Press mixture into the bottom and up the sides of a 9-inch pie plate. Place in freezer until firm, about 15 minutes. With an electric mixer, beat sweetened condensed milk, cream cheese, lemon zest, and lemon juice until smooth. Set aside. Use an electric mixer to beat heavy whipping cream and sugar until stiff peaks form. Fold whipped cream into condensed milk mixture. Pour filling into crust and smooth on top with offset spatula. Refrigerate until firm, at least 2 hours. Instead of using heavy cream to make fresh whipped cream, you could use 1 cup of Cool Whip. This entry was posted in Desserts, Pies and Tarts and tagged lemon, no bake, pie. Bookmark the permalink. Doesn’t set properly. I refigerated it for over 4 hours before cutting and it still ran all over the plate. Not enough lemon flavor either. Lemon desserts should make you pucker and be mouth watering. I’m a seasoned Baker and this was an epic fail! On a good note, the crust is amazingly delicious. Made this pie for dessert last night and was so disappointed that there was very little hint of lemon flavor. I used 2 fresh lemons plus the zest. My husband loves lemon ice box pie and I chose this one off Google. Now I have to throw it away or put some berries on it to give it some flavor. Not what I was hoping for. The creaminess and look is beautiful. Any suggestion as to why it had virtually no lemon flavor? Did you mean 1/2 pint of whipped cream instead of 1/2 cup? This is wonderful! I used lemon shortbread cookies and reduced the butter as the cookies already had quite a bit. Since I’ve never made whipping cream, I used the store bought in a can. I also added more lemon juice as I always do to anything lemony. Thank you for this delightful recipe! Delicious! Just the right amount of lemon flavor! i actually made this and it was fantastic. I made a topping out of whipped cream and sour cream wild a couple tablespoons of powdered sugar. put it on top of the pie, then added blueberries to the top and almond slivers around the edge. it was fantastic. You alterations sound incredible Michelle. Glad you enjoyed it! Looks delicious! Will definitely try this. This looks magical Christin! I love love love lemon desserts! Yum! This looks so delicious. And I love that you don’t use “whipped topping” but real whipped cream. I love icebox pies! I tried a lemon raspberry icebox pie this weekend and would love to try your recipe too! 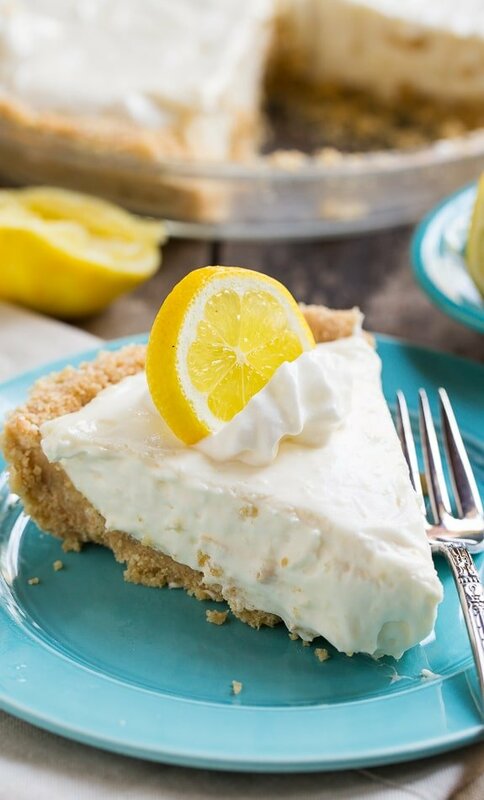 This lemon icebox pie looks so refreshing! Sounds super easy too and that is my kind of pie. 🙂 Perfect for summer! Oh my gosh, my mouth is watering! Lemon desserts are my absolute favorite! 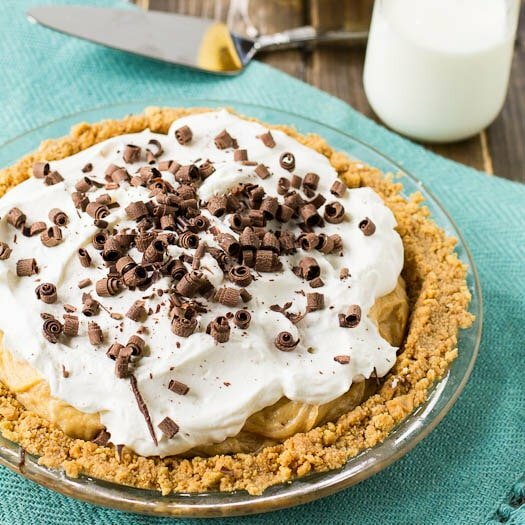 The shortbread crust sounds amazing and I love that this is no bake! This lemon cake looks amazing! Lemon is the perfect flavor for summer with it’s light freshness! That shortbread crust! That sounds so so good. I don’t know if I’ve ever used shortbread in a crust before .. I need to make that happen!! 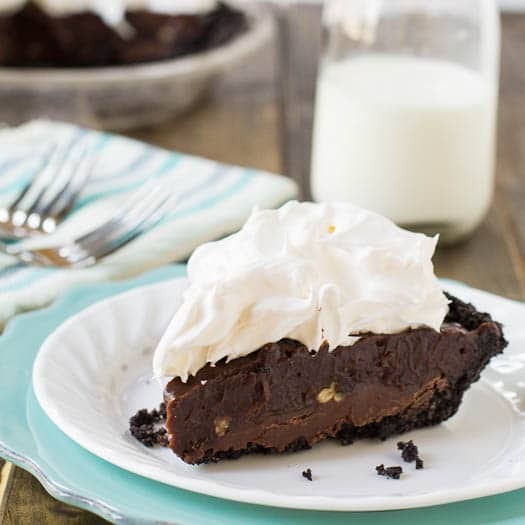 This pie looks so creamy and delicious, and I love that it’s no bake! Perfect for summer! Drooling like crazy right now! This looks absolutely delicious! And I love that it’s no bake!!! Pinning to try later! 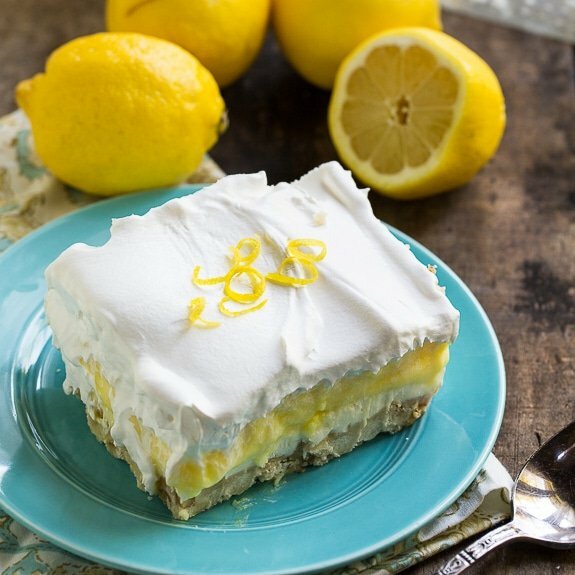 Icebox cake is my favorite, so I’m loving this lemon version in pie form! Looks perfect for the summer, Christin! That looks just perfect for a beautiful summer afternoon! Pinned. 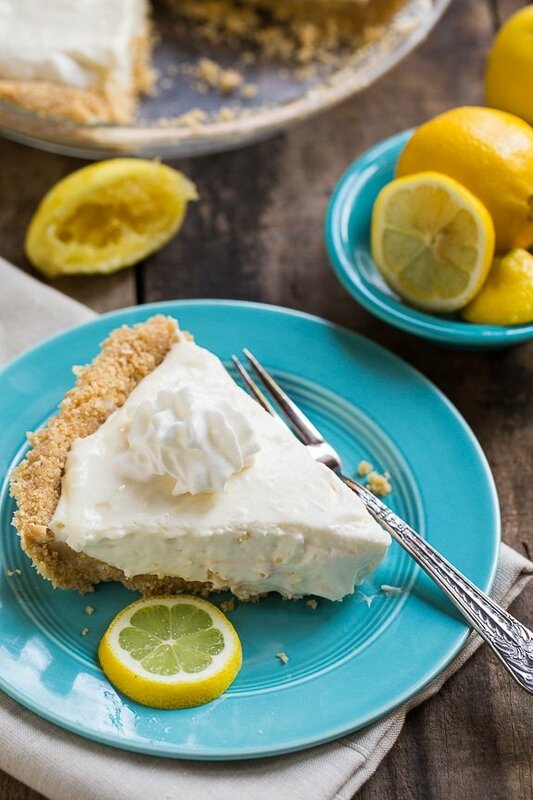 This reminds me of your awesome Lemon Lush and I love the graham cracker crust! I’d definitely make that from scratch and the entire dessert is stunning!